Easter is just around the corner and so it’s time to start on planning out what you want to do and give out to the special people in your life. Easter is a fun time to celebrate with beautiful pastels colors and all things SPRING~Flowers, sun, grass and of course, the bunny rabbit. This year my daughter and I are going to make Hoppy Easter Boxes for our family and friends. We plan to put in candy, stickers, and other fun items we gather from Amazon. Please make your own Easter Box with the instructions below. Have a good time! Last weekend we went to Micheal’s Craft Store and picked up a pack of white card stock paper. If you don’t have a Michael’s by you then you can order some paper off AMAZON (under $10) and also items to put in the boxes- Easter Stuffers (see ideas below). You will also need GLUE or DOUBLE-SIDED TAPE and scissors. Print out this FREE PRINTABLE on the letter size paper card stock: Click on picture and it will take you to a printable. Now you know there is so many gifts you can put in these cute Easter boxes so get creative and YES we want to see your pictures! Leave us a comment or tag us on our Facebook Page. 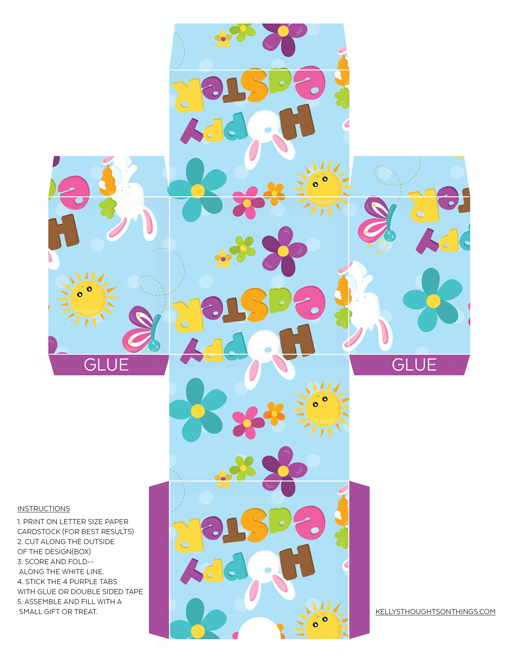 Thank you for this free printable Easter Box. It’s very cute. You are welcome Lauralee! We will have more printables coming in a few days.